Want to practice your Portuguese? Todxs são bem vindos! Everyone is welcome! Join us for our weekly Bate-Papo - - Portuguese conversation hour! Enjoy some coffee, tea and snacks while improving your Portuguese skills. All levels are welcome. 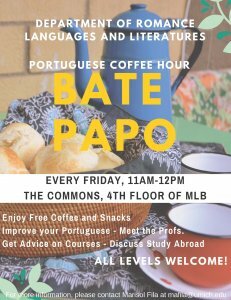 Bate-Papo meets every Friday 11am-12pm in the RLL Commons (4th floor MLB). Hope to see you there!